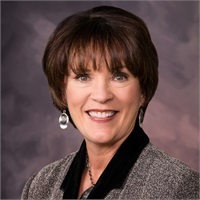 Linda has been with LPL Financial in Wichita for nearly 2 years as our Client Relations Manager. She is responsible for serving a team of 4 LPL Financial Advisors with preparing and ensuring that new and existing account documents process successfully as well as keeping the office running smoothly. Her experience includes working 25 + years at Marriott International Corporation as a Senior Business Analyst. She was born in Wichita and raised in Whitewater, KS graduating from Remington High School in 1981. She received her Associate of Science degree in Travel & Tourism from Cloud County Community College. Linda and her husband Don enjoy living in the peaceful small town of Whitewater. In her spare time she enjoys flower and vegetable gardening (landscaping), patio time by the chiminea, boating, cooking and entertaining friends and family. They have 2 children, Kyle and Lauren and 1 grand puppy (Kymber)! Kyle lives in Wichita and works for Hammel Scale Company and Lauren is attending Hesston College to earn her Bachelor of Science in Nursing. She would be happy to assist with any questions you might have or in scheduling an appointment to meet with one of our advisors to assist in planning for your future!